Even though, I'm still a Tech Ronin and writing about it, I've migrated over to a new domain: janet.tokerud.com. The blog name is now Independent Knowledge Professional. That sounds a little more formal and maybe it is. But, it's still about the fact that a great many of us are knowledge professionals and it may behoove us all to think of ourselves as independent. As you know if you've read much of tech ronin, the traditional idea of a permanent job has become obsolete. You may have a so-called permanent job, but most of us don't. As usual, I'm emphasizing how your use of technology can help you along your way as a tech ronin or independent knowledge professional. Most of us do knowledge work these days. The personal computer and now smartphones and tablets are making it easy to take your working environment wherever you go whether that's the livingroom couch, a local coffee house or a client's home or office. This is a very good thing if you like being able to compete in your favorite niche. I've used Macintosh computers for many years and don't own a PC, so you'll find my expertise slants towards the Macintosh Way. Now a days, that includes iPhone, iPod touch and iPad. I'm currently writing about the best apps for knowledge functions. I've covered information capture and brainstorming so far. Next up is gathering information and ideas. I just ordered the 32gb + 3G. I wanted to get wi-fi only and save $129 but remembered all the times I've been frustrated being stuck without an internet connection on my laptop or iPod touch. I do have an iPhone 3GS and plan on keeping it but I figured it will likely be a certain amount of hassle to substitute iPhone 3G access for access on the iPad when that's what I want to use. Was on the fence due to the expense but finally went for it since none of us really know what kinds of use cases will materialize that may benefit from 3G plus the AGPS and my sunk cost is only $129 since I don't get stuck with a cellular contract. I'm confident that the 250 mb, $15/month service will be adequate for my needs since I do have access to wi-fi most of the time. Except perhaps when I'm traveling which is typically only 2-3 times a year. Cellular access could wind up being the crucial ingredient in making the iPad a laptop replacement. I can imagine using a remote control program of some sort to run things on my Mac at home from my iPad to look things up or file transfer to Drop Box or Mobile Me while away from a full-powered computer. Got the Apple case for the 3-position capability which I bet is needed for things like typing. Don't care about it as a photo viewer though but maybe other notifications now and down the road. And hoping for widget support in OS 4. Did not get Applecare. Willing to take my chances and can reconsider once I have it in hand. I'm hoping to take the iPad with me on my morning exercise walk with destination at Caffe Acri. If I must, I'll take my Macbook Air which I still love and appreciate immensely. I expect that most days I'll get by fine without my Macbook Air as the five most likely things I'll be doing while out for coffee is surf the web, read, check and reply to email, plan the day's tasks and write my morning journal entry -- probably in an iPad version of Momento. Kindle vs iPad for Book Reading. When both devices are available, I expect to read fiction on the Kindle and non-fiction with lots of illustrations on the iPad. If I didn't have a Kindle, I doubt I would buy one at current prices, but I am glad to have it for the smaller form-factor and lighter weight for reading fiction in bed especially. I do appreciate the e-ink when lighting conditions aren't a problem. However, now that the Kindle will have competition for which device I carry, it is unlikely it will leave the house unless I'm in the middle of a page-turner and have time to do that kind of reading. I sure hope I like typing on the iPad. I am big into writing and want this tool to be a moleskine replacement. I'm not optimistic about handwriting on iPad due to what I recently read on JK On the Run about handwriting recognition and the iPad. I hold out a little hope, though, that individual iPad apps like Evernote or NoteTaker will add more handwriting capability. Then there's the on screen keypad. Not so sure how well I will like it but it's got to be better than typing on my iPhone (fingers crossed). It competes with the great typing experience on my Macbook Air. Also, might get a super light, small Bluetooth keyboard - like one that rolls up if available. I want the iPad to be a tool for thought (remember the great Howard Rheingold book Tools for Thought? 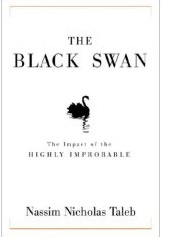 Read it online free at the link - one of my all time favorite books). The more I use Twitter as a microblogging tool, the more I want features that I've come to take for granted in the blogging realm. One of those is tag clouds. TweetClouds to the rescue. If you use Twitter as a microblogging platform rather than a shared virtual space among close friends, you might want your own tweet cloud. Just go over to tweetclouds.com and enter your twitter account name and press go. As you can see above, it took 111 seconds to calculate my cloud. That's how long it took with 150 tweets to process. Tweetclouds have taken off in the Twittersphere this week so going is a little slow if you have a lot of tweets. But, how cool? After it is done, you see your tweetcloud and get your own page and URL. Here's the tokerud cloud URL. The next step from my point of view is to have links in each of those cloud words so I/you can click on a word and see the tweets. I'm thinking everyone on Twitter needs a dynamic cloud that is connected to search. Don't get me wrong, Twitter is above all fun. But, part of using Twitter as an information aggregation tool is building a good list of people to follow. I am following about 100 people right now. I spend a bit of time each day browsing for new people to follow. These tweet clouds would be a boon to this endeavor. If every tweeter had his or her own searchable cloud, I could tweetscan for people based on my interests and some resourceful twitter developer could match my cloud to other tweeters' clouds and give me friend recommendations. Wouldn't that be fun? Friendfeed.com launched today. It's been in Beta for a while. Very cool at least on first blush. It aggregates a whole bunch of posts according to your settings. I set my Friendfeed to show del.icio.us, flickr, tech ronin and twitter posts for openers. The people behind this are from but not currently of Google. This is moving towards what will be better when OpenID gains adoption. Check it out! MegaPhone used to be iPhoneDrive. 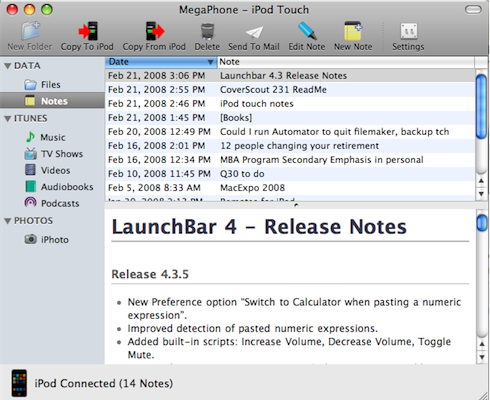 MegaPhone 1.5, from Ecamm Network, finally lets you edit notes. There is a large caveat which is that it seems to need to reboot your iPhone or touch every time you edit an individual note. That's pretty inconvenient should you need to edit lots of notes. Each time you edit a note, prepare to wait 30 seconds or so while your device reboots. 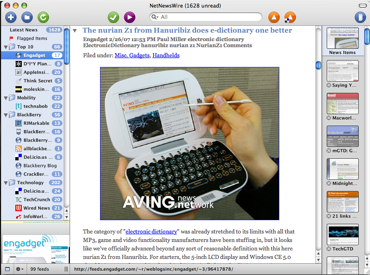 Editing notes and pasting content from your Mac does work and that's the main thing for now. One interesting little extra. As soon as you are done editing notes or adding them by dragging or by using the copy to iPod (or iPhone) command, you can eject your iPhone or touch and you've got your new and newly edited notes with you. The content you paste in will retain its font, color and style information. This means you can see color and different fonts and such in your iPhone or iPod touch notes. You can copy PDF, RTF, RTFD and Word documents in as individual notes. Graphics will not make it over, RTFD and PDFs convert to RTF minus any graphics. I'm good with that. Graphics would be nice but that's not essential. I scored the new iLife 08 and iWork 08 today. That's a great impulse buy and I'm sure Apple knows it. What a deal for $158. 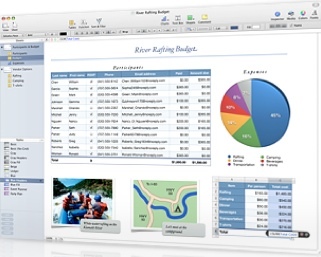 With the upgrade of Pages and addition of Numbers, I'm hoping to forego an upgrade to the next version of Office for Mac. I actually have never upgraded to Office 04. So, why bother with Office 08? it better be good is all I can say if Microsoft wants to have a prayer of getting people like me to upgrade. Meanwhile, I'm trashing Excel. OK. I'll keep it around but I hope to use it rarely if ever. Of course, there may be places where I like Excel better than Numbers, but right now I'm liking Numbers. Ease of use is excellent. The program isn't very big which is a major plus. And it feels way different (Apple does not disappoint). The differences in Numbers are several but I can't do a point by point comparison because, like I said, I'm still using Excel X from 2001 or 2002. I'm just about positive, though, that this paradigm change in Numbers is not in Excel. See the photo above. The two spreadsheets there are tables. From what I can see here, Apple has done a really nice job. You want to work with Numbers. I haven't had that feeling about a spreadsheet program in a long, long time. Numbers has sheets. Excel has worksheets. Similar there. But numbers has tables and you can have multiple tables per sheet. A table is like a mini spreadsheet object that can have as many rows and columns as you want and can be dragged around to the exact spot you want it on the sheet. You can insert rows and columns right on the sheet. Calculations that I tried are easier to use. Charts are droolworthy. There's a certain scrumptiousness to the look and feel of the application itself. Numbers is accessible, easy and fun. The way I figure it, that's what most of us want in a spreadsheet. If you push spreadsheets every day for hours on end, maybe that's not what you want. But the majority of us use spreadsheets less frequently and less intensively. That's the sweet spot Apple exploits with Numbers. I hope to write more on this the next time I get into a spreadsheet project. Actually, knowing me, I will think up a spreadsheet project just so I can play with Numbers some more. You can download their 30-day trial free or just pop the $79 to get Numbers plus improved versions of Pages and Keynote. The first program I tried today was iPhoto. I take a lot of photos and wanted to see what else I could do. Mostly, I've just played around with the new Events feature. I loved having all my photos grouped by import batch. Some of the batches are a mish mash of things for that day. But, often enough, the batch deserves its own grouping and now I don't have to do it the hard way. Good thing. 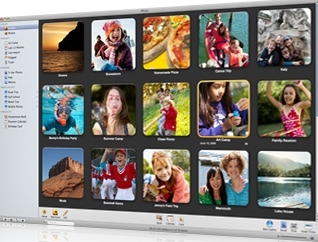 The Events view in the multiple photo view shows a single photo for each event. This seems much more manageable. You can easily see mini views of each photo just by moving your cursor over the single photo. You can split and merge events to modify the groupings. I plan to create a big iPhone July 07 event which will be all the iPhone photos I've collected online in the first month. This is fun people! Photos are great to play around with and this is a substantial upgrade to iPhoto so the fun gets even better. You also get easy integration with .Mac photo galleries and other cool features there where you can email photos taken on your iPhone and let your friends email photos to gallery photo Events. 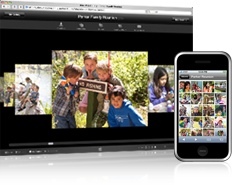 That's going to be great for aggregating photos taken at parties and other get togethers. And for interest groups I would think. There are new flag and hide functions that should come in handy. I am not planning to buy a new Mac in the next couple months, so I couldn't wait. If you do buy a new Mac, you'll almost surely get iLife for free. I couldn't wait, but that's just me. Surface Computing, Bring it On! Last week, Microsoft unveiled Surface Computing at the D (All things Digital) conference. The demos were great. The UI is one of my main areas of interest in computing. Augmenting human talents. Using your finger or hands to move things seems like a really good way to unlock our amazing spatial intelligence. While the left brain is kept in its place, all sorts of possibilities emerge. Of course, this is all vaporware right now. Undoubtedly it is being rushed out in response to the imminent release of the iPhone (June 29th according to the new ads). But, whatever. Give me goodies like surface computing that extend the boundaries of what we think a computer can do. I would love to have one. Here's how I would want to use one. In consulting with a client. We sit side by side or across from each other with the coffee table right there. We move stuff around, pull things out, zoom in, get creative. Microsoft says this is a new paradigm. Yeah! Make information exploration more like a sport. Use all that native intelligence that computers have not yet tapped. OK. It's not Minority Report. I just watched the movie on TV the other night. Wonderful technology that. I love the way you could shove stuff out of the way. Actually, the shoving, pushing and *throwing* you will do as you flip through images, albums and contacts on an iPhone will be a lot like that. Just a lot more portable with a smaller screen. Obviously travel agents could have you come in and work with them on one of these. Or career counselors working with you around your skills, interests, abilities vis-a-vis careers, industries and opportunities. Or how about boomer retirement planning? Investment counseling. Or where to live? I would love one of these things. I doubt that I am the only software developer who has imagined or wanted something like this for a long time. Kind of like knowing that eventually we would have our music collections on hard drives. The plan is first to introduce this for commercial purposes at somewhere between $5000 and $10000. And eventually drive the cost down enough to release it as a more affordable offering. 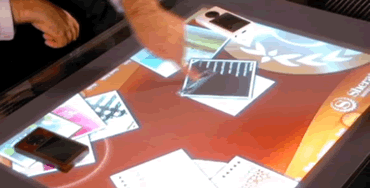 After that we get lots of surfaces in the house with these kinds of smart, interactive, touch screens. In the hallways. Score one for Microsoft! Ooh! I hardly ever even think about using alpha software, but I wanted to see what NNW 3 had going. Brent Simmons was so enthusiastic about his new baby that I had to see why. Really slick. Note the right column of tiny screen shots. That is so much more fun that the typical list of tabs showing pages you have clicked on. Makes it easier to navigate too. No problems so far. I did take his advice to backup my netnewswire folders first because I may need to go back to 2.1 if problems arise. UPDATE: March 7. Eight days later I am happily using NNW3a and do not plan to turn back. It has crashed a couple times and misbaved once or twice, but no data was lost and I just did a force quit and restarted the app. No problem. If you enjoy NNW, you may want to try this out after backing up a couple files that you will be advised to backup. I also use Google Reader sometimes. But, since moving up to NNW3, I have been using NNW more and GR less. I started writing in my Moleskine daily when I incorporated it into a daily package. A group of things I do together. I live about two miles from downtown Mill Valley, California. A town of 14,000 people, 12 miles North of San Francisco. The heart of Mill Valley, is the Depot Bookstore & Cafe which opens onto a small town square. The cafe is the best nearby place to sit and write. It seats about 50 people. That's about 40 more seats than you can squeeze into the local Peet's across the street. Peet's admittedly has better coffee, but the Depot's coffee is pretty good and the people-watching, cafe and comfortable seating makes it better for casual writing. But I digress. The point is that this is a whole little downtown with quite a lot of character and only a modicum of cheesy touristy stuff. It's got its fair share of high-end touristy stuff, but hasn't succumbed to T-shirt stores. You would like it. Luckily, the eggs and toast breakfast served at the Depot cafe works for me. I eat the toast dry (no jam even though they have great jam here) and ask for 1 slice rather than the default two slices to avoid temptation. You probably don't want to know, but I eat the toast with eggs -- combining the two which allows the eggs to serve as the topping on the toast and the toast to add a little variety to the eggs. I love food and hate food shopping, prep and dishwashing, so an eggs, toast and coffee breakfast for $6.47 works as a daily habit. So, I walk all the way from my house or drive about six blocks and walk from there. Either way, I get at least two 20 minute walks. One going and one coming back. The route I take is on Ethel Avenue which is up above the main drag - Miller Avenue - and in the trees and hills enough to make it easy to get some good exercise if you walk briskly on the downhill parts. The nature, including Redwoods along the way, is a major plus. And, hardly any cars drive on Ethel. It is really narrow so one car passing per walk would be above average. The walking and breakfast combo would be great in and of itself. But, I add in a large ruled Moleskine notebook and daily entries to ratchet things up a notch. I date the entries something like: Dec 9 (1) Saturday. The parens around the 1 is really a circled 1 and I number the pages in an entry that way. All my moleskine pages are numbered in spreads. One page number per spread of two pages. This hasn't really been of much use but sometimes I will refer to another entry and having a page number to refer to helps. Although, the date would also probably suffice. Whatever. I like having the page numbers just in case. I can see how far into the book I am. Finally, what do I write? it varies. I have gotten into the habit of entering stock market index numbers, the crude oil price and value of the dollar. This might be a way to get into writing. It's easy. No thinking. And, I've found that the stock market's ups and downs affects my software sales, so it is of some interest. And the value of the dollar impacts foreign sales. It's fun. I usually read the business page while I'm there and those stats are available. I also frequently enter short quotes or notes extracted from things I read in the papers there. The SF Chronicle is almost invariably available free. Sometimes you get a treat with the New York Times. I'll read a bit of that if there's something really good. I also report on things I've done in the last 24 hours. Daily diary kinds of things but that's very short usually. The main goal of my writing is not to document my life, that's a secondary thing. I like to capture some of the highlights. Things of note. When traveling, I'll write more about what I've seen that day. Average days, I might write more about what work I've accomplished. The big topics are (1) what do I need and/or want to do that day or soon, (2) my ideas and observations and (3) work ideas, observations, analyses which could be ideas on marketing my software or how to do something in software or a new feature I should add and (4) goals and wishes and possible future scenarios for my life. My Moleskine is thus a thinking tool and way to keep my focus and advance my work (for pay and otherwise). It's almost like a listener. If you've ever wished you had two of you, this is one way to do it. I'm the reader/listener and the writer. Putting things down in writing lets me converse with myself I guess. It gives some distance. It's powerful. As this post is getting quite long, I'll just say that on good days I write 6 to 8 pages and some days it is more like one. This writing-walking-breakfast thing is a major part of my life. It is wonderful. Perhaps if I didn't work at home it wouldn't be as desirable to get out somewhere everyday. Perhaps the conversational aspect of the writing wouldn't be so valuable. I love it. It feels like a healthy and useful luxury and I hope I can always carve out a space in my schedule to do it. So far I've been doing it for close to a year and there's no end in sight.